Inertia plays music that is a hybrid of all things creative and thought provoking. A steady mix of jazz, rock, metal, punk, reggae and other types are what make up Inertia's sound. 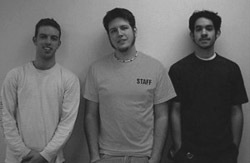 All three band members listen to all types of music and are influenced by many. The key bands that influence Inertia's sound are The Police, 311, Incubus, Stone Temple Pilots, and The Red Hot Chili Peppers. Generally, their music has been described as Melodic-Groove-Oriented-Funk-Rock. It is up to the listener to make his/her own opinion as well. Inertia started out as a group of lifeless peniles who eventually grew into elephants. Now, as time has progressed, the boys have created music that salutes all that is in the Animal Kingdom.